Both poetry and painting reached their creative peaks in China during the Tang dynasty. 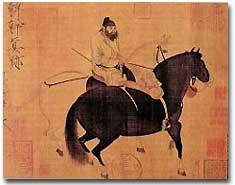 Herder's Horse was painted by Han Gan, one of the most famous artists in Chinese history. In the chaos that reigned after the fall of the Han dynasty in 220 C.E., no one knew if a unified China would ever again be possible. Warring clans, political murders, and foreign invaders characterized the next four centuries in which the Three Kingdoms (220-280 C.E. ), the Western and Eastern Jin (265-420 C.E. ), and the Northern and Southern dynasties (420-588 C.E.) did little to build upon the accomplishments of earlier Chinese culture. The feuding clans of China were finally united once again in 589 C.E. by Wen-ti and the Sui dynasty (581-617 C.E. ), a ruthless leadership often compared to the Legalist Ch'in regime. The Sui dynasty accomplished great feats, including another restoration of the Great Wall of China and the construction of the Great Canal linking the eastern plains to the northern rivers. However, the Sui taxed peasants heavily, and forced them into hard labor. Lasting only 36 years, the Sui dynasty weakened after suffering heavy losses in fighting against Korea. It fell apart when the general population lost faith in the government and revolted. At 1,100 miles long, The Grand Canal is a building achievement on par with the Great Wall of China. The rise of the Tang dynasty in China mirrored the rise of the Han over 800 years earlier. Like the Han dynasty before them, the Tang dynasty was created after the fall of a ruthless leadership. And like the Han before them, the Tang dynasty had their own powerful leader, Emperor Tai-tsung. The first emperor of the Tang dynasty, Kao-tsu (618-626 C.E. ), continued many of the practices begun during the Sui dynasty. He granted equal amounts of land to each adult male in return for taxes and continued the trend of local government rule. Kao-tsu also created a monetary system of copper coins and silk ribbons. He wrote a set of laws, revised every two decades that lasted into the Ming dynasty of the 14th century. One of Kao-tsu's sons, General Li Shih-min, succeeded in eliminating all political rivals of the Tang and established firm control of the Tang dynasty over the newly reunified China. He then proceeded to murder his brothers, and forced his father to abdicate the throne to him. Preferring his temple name, Tai-tsung took the throne in 626 C.E. The Golden Age of China had begun. Tai-tsung maintained many of the political policies already in place. He shrank the government at both the central and state levels. The money saved by using a smaller government enabled Tai-tsung to save food as surplus in case of famine and to provide economic relief for farmers in case of flooding or other disasters. Civil exams based on merit were used once again and resulted in wise court officials. ©1996 Museum of Fine Arts, Boston. Emperor Tang Taizong commissioned this portrait of himself with 12 previous emperors tracing back to the Han dynasty as a warning to his son, the prince, to learn from the mistakes of his ancestors. The only major military pressure came from the Turkish frontier, but the Turks were defeated by 657 C.E., beginning 150 years of Tang control over the region. As a result of these improvements and victories, the common people were successful and content. 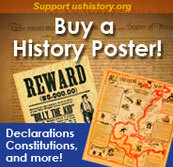 It was during this successful era that woodblock printing and gunpowder were invented. Meanwhile, the borders of the Tang dynasty expanded far into Korea and central Asia. China became even larger during the Tang dynasty than it had been during the Han. The Chinese regularly communicated with lands as far west as Persia, present-day Afghanistan, and the Byzantine Empire. Goods and, more importantly, ideas continued to be exchanged on the Silk Road. The capital cities of the Tang dynasty, Ch'ang-an and Loyang, became melting pots to many cultures and a large number of beliefs such as Zoroastrianism and Islam. Buddhist missionaries had begun the difficult journey from northern India to China as early as the 1st century C.E., but it was not until the Tang dynasty that Buddhism reached its height of popularity in China. By the mid-7th century, new Buddhist schools of thought had developed a distinctly Chinese flavor, including the Ch'an school, which later evolved into Zen Buddhism. 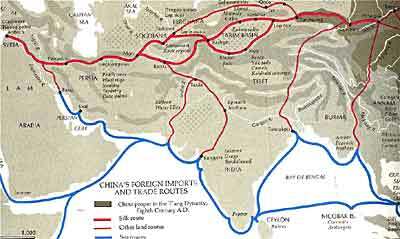 The Tang dynasty was a period of expansion, especially in trading with foreign lands. Caravan routes traveled as far as Syria for items ranging from glassware and tapestries to jasmine and other exotic herbs. However, during the late Tang period the economy was suffering. The emperor Wu-tsung, a devout Taoist, attempted to eliminate Buddhism from 843 to 845 C.E. by closing thousands of temples in order to take control of their wealth. Although the attempt to destroy Buddhism lasted only a short time, the religion never recovered, instead beginning a steady decline in China. The decline of Buddhism and conflicts between the Chinese and foreign traders marked the beginning of a change in Chinese attitudes. After hundreds of years of cultural exchange, by 836 C.E. no foreigners would be welcome in China. 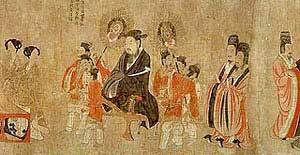 A great contribution of the Tang dynasty came years after the death of Tai-tsung, when the dynasty was at its political and economic height. The Tang dynasty was a golden age of art and literature for the Chinese. Li Po, Tu Fu, and Wang Wei were poets renowned for the simplicity and naturalism of their writings. The poetry and art of the times however were deeply affected by the rebellion of northeastern troops against court officials in the capital city of Ch'ang-an in 756 C.E. Named after the leader of the rebel troops, the An Lu-shan Rebellion caused the deaths of countless people, including members of the royal family, and marked the beginning of the end for the Tang dynasty. The decline of the dynasty increased during the second half of the 9th century as factions within the central government began feuding. These feuds led to political plots and scandals, with assassinations not uncommon. The dynasty split into ten separate kingdoms as the central government weakened. After a series of collapses beginning around 880 C.E., northern invaders finally destroyed the Tang dynasty. The Golden Age was over. During the Tang dynasty, women had independence and opportunity unmatched by any other ancient period. Trained in the classics and music, Wu Zetian became the only female in Chinese history to rule as empress. The Women in World History Curriculum chronicles how she challenged Confucian beliefs about female leadership, came to power, and ruled over an empire at its height. Eleventh century Chinese inventor Su-Sung's water clock stood 40 feet high and kept accurate time. This ancient technological development was lost when Tartars invaded in the 12th century. It reemerged in the 17th century, but by then mechanical clocks had long ago rendered water clocks obsolete. The engineering department at the University of Houston tells the details of the story here. China enjoyed both its greatest heights and most terrible lows under the emperors of the Tang dynasty. The early days brought land expansion and increased trade. However, foreign pressures collapsed the borders of the empire as the dynasty declined. Amazingly, poetry flourished during the decline, but the Lu-shan Rebellion destroyed two-thirds of the population and sealed the fate of the dynasty. During the 8th century, the city of Ch'ang-an, the capital of the Tang dynasty, was the largest, richest, and most advanced city in the world. Its National Academy brought students from throughout Asia to learn religion, art and architecture. Foreigners attained high positions in the Chinese government. Trade flourished, and cultural exchange brought new ways of thinking to an ancient land. The Chinese were so technologically advanced that their inventions often preceded European discoveries by hundreds, even thousands of years. From papermaking to firecrackers, dynastic history is full of interesting creations. Even the kite is a purely Chinese invention. Even Marco Polo had to stand in admiration when he saw the Grand Canal. Begun during the Han dynasty and finished in the 14th century, the 1,100-mile canal allowed for trade and prosperity when other forms of travel could take three times as long. Read about the pros and cons of this architectural wonder comparable to the Great Wall of China.